More than 60 independent British festivals - including Boardmasters and Bestival - have pledged to rid their sites of single-use plastic by 2021. As a minimum, those festivals have committed to banning the use of plastic straws this year. It's hoped that will extend to items such as plastic bottles in the future. The Association of Independent Festivals (AIF) says it wants festival-goers to think about "re-use", not "single-use". Paul Reed, AIF's chief executive, says a three-year target to eradicate single-use plastic is a "realistic timetable" but admits there will be "operational challenges" for festivals that run on tight budgets. Sixty-one festivals have signed up to the AIF's Drastic On Plastic campaign, with no members choosing to opt out. "Considering the environmental impact of our industry it does feel like it's really time to take some collective and affirmative action," he says. It comes as the government proposes a ban on plastic straws and cotton buds. Other festivals to sign up to the AIF's pledge include End Of The Road, Boomtown Fair, Standon Calling and Kendal Calling, and it's up to each event's organisers to do what they can to help reduce plastic waste. Boardmasters, one of the largest festivals to sign up, has announced it will start a re-usable cup scheme in an effort to reduce the amount of disposable cups on site. 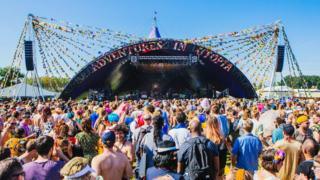 Shambala festival in Northamptonshire has been hailed as one of the best at reducing plastic waste at its site. Since a campaign to reduce waste was launched in 2013, event organisers claim 96% of their customers now bring in reusable bottles. At first, Shambala co-founder Christopher Johnson says, it was a "minor inconvenience" for people not to have a pint cup that they could throw away wherever. "I guess one of the key benefits is that you suddenly have a festival without litter. Take the disposables out and suddenly you get a clean site," he says. The festival has since installed more water taps, stopped stalls using sauce sachets and offered re-usable bar cups. It's now tackling another festival favourite - glitter. "What is a festival without glitter?" says Christopher. "So when we were thinking about it, we found out about bio-glitter. It's a like for like so we'll be encouraging people to use that instead." Glitter is made up of tiny pieces of shiny plastic measuring less than five millimetres, known as microplastics, which can pose a potential threat to aquatic life. Image caption What's a festival without a glitter beard? Melinda Watson, from campaign group RAW Foundation, admits it will be hard to eradicate single-use plastic completely and there will be challenges to find alternatives. "If festival goers want to bring in a big bottle of cola, they can't bring in glass and that's a problem," she says. "So many of the supermarkets - in the local vicinity of whichever festival it is - are unashamedly selling 'festival kits' which encourages that disposable culture." Larger festivals such as Reading and Leeds and Download, both run by Festival Republic, say they are doing their bit to reduce plastic waste. Festival Republic Managing Director Melvin Benn says: "Our aim is to not only implement schemes to minimise the use of plastic on site but to educate our audiences at the same time. "Whether that's through our long-standing ban on single-use plastic across all food traders since 2009, or working in partnership with Greenpeace UK on the introduction of our deposit return scheme for all bottles, we're ensuring that our waste reduction and recycling rates improve year on year."